Petals: (Make 4). Using red, cast on 7 sts. 2nd row: (Kfb, k to last 2 sts, kfb, k1. 9 sts. 3rd row: As 2nd row. 11 sts. 4th row: As 2nd row. 13 sts. 5th – 8th row: K.
9th row: Ssk twice, k to last 4 sts. K2tog twice. 9 sts. 10th – 12th row: K.
13th row: As 9th row. 5 sts. 17th row: K1, sk2po, k1. 3 sts. 18th row: K. Cast off. Centre: Using black, cast on 16 sts. Cast off. 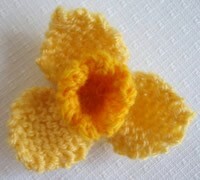 shape with a small stitch behind pairs of petals. black straight stitches and French knots around it. 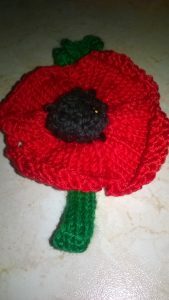 Yarn – Any red and black, I used DK. Hook – 3.5mm, but try larger too to see the effect. Round 1 (alternative): Make a starting chain of 4, ss to form a circle. Make 10 dc in the circle and join with ss to first dc. ss in next 2 st. rpt from * around and join with ss. next 2 sts. Rpt from *around, fasten off. Make a magic loop, 8dc into loop, tighten and fasten off. Red Cross organises the collection of the teddies, which are then distributed via the Ambulance Service, the Fire Brigade and hospitals to children and others who have experienced a trauma. They are also given to residents in nursing homes. Teddies can be made in a variety of styles. 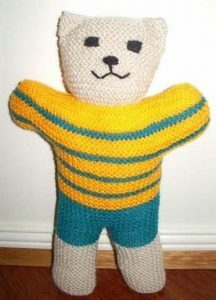 The pattern describes a teddy with pants and a shirt, but the pattern can be varied. The important thing is that the teddy has a personality of its own! Note: Julie Timewell, Coordinator, Tight Knit World is happy to finish Trauma Teddies once they have been knitted. Stuffing is available from Red Cross or nylon stuffing from Spotlight may be used. FINISHING • Sew on face. Fill with filling provided by Red Cross or use nylon filling from Spotlight. Sew top of head together. Gather around the base of head to form neck. Pinch corners of head and sew to form ears. 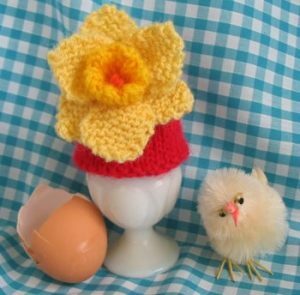 How about a bright yellow daffodil to decorate an egg cosy? I created this pattern several years ago and have used it endlessly ever since (with a few variations along the way). 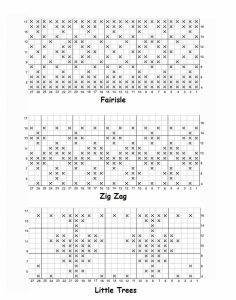 The pattern is very easy to follow (I don’t do difficult). Please note I have written the instructions in a way that ‘beginners’ should be able to follow. If you are an experienced knitter please don’t be put off by the rather lengthy instructions. You will need a small amount of yellow DK yarn, pairs of 3.25 mm and 4 mm needles (US 3 and 6) and a couple of hours to spare. Start with the centre trumpet. 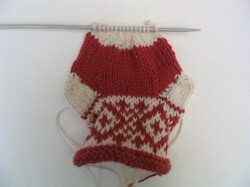 Using 3.25 mm needles (US size 3) cast on 14 stitches. Change to 4 mm needles (US size 6). Changing to larger needles gives the trumpet a better shape. To create a little wavy edge to the trumpet you now need to do a picot edge as follows. 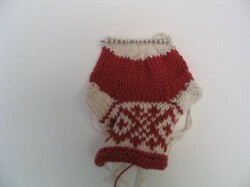 Row 6: Knit 1, (slip 1, knit 1, pass slip stitch over the stitch just knitted). 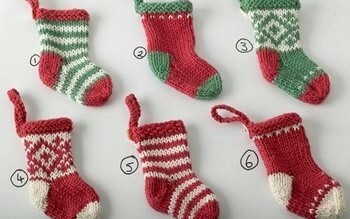 Repeat the instructions in the brackets to the last remaining stitch. 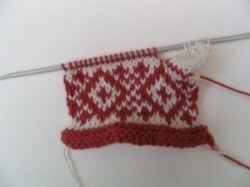 Knit 1. Row 7: Purl 2 stitches then pick up the yarn between stitch 2 and 3, put it on the left hand needle and purl it as a stitch. Purl the next stitch then pick up the yarn before the next sitch and purl. Continue doing this to the end of the row (by picking up these short lengths of yarn between stitches you are replacing the stiches that were lost on the row before). You should now have 14 stitches on your needle. Row 11 purl. Break off the yarn leaving a length of about 20 cm (8 in). Remove all the stitches onto this length of yarn ready for drawing up later. 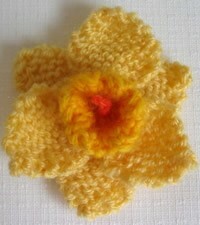 Using a separate length of yarn (not the one threaded through the stitches) stitch together the two short edges of the daffodil trumpet and secure. Now pull the thread that passes through the stitches, draw up and secure tightly. This will form the inside of the trumpet. 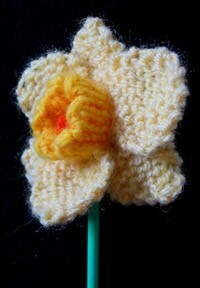 Fold the trumpet along the picot edge and secure the cast on edge to the back of the daffodil. Don’t draw up this edge. (shown above). The trumpet is complete. You will need 6 petals. I have used a paler yellow for these. 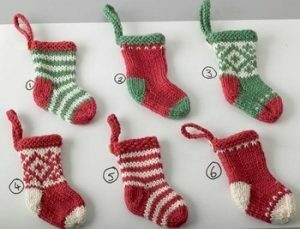 They are knitted in garter stitch which will ensure they don’t curl. 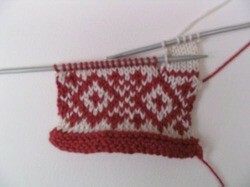 Using 3.25 mm needles cast on 7 stitches. Work 5 rows. 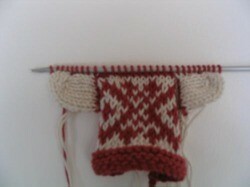 Knit 2 stitches together at the start of the next and every following row until you have 3 stitches remaining. Break yarn 20 cm (8 in) from the work and remove stitches onto a sewing needle. Draw up and fasten off (petal above left). Now draw up the cast on edge and secure to give the petal a nice curled shape (petal above right). Stitch 3 petals to the back of the trumpet as shown above. Stitch the remaining 3 petals behind the first 3 petals as shown above. To make the stamens/stigma for the centre of the flower. 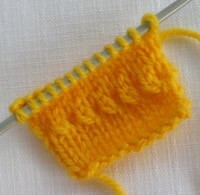 Cut a piece of yarn (orange or yellow) 20 cm (8 in) long and wrap round a needle as shown. Tie 6 knots as shown above. 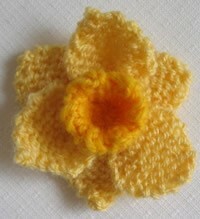 Thread each tail of yarn through to the back of the daffodil and secure tightly. The bloom is now complete and ready to add to your egg cosy. As you’ll see I’ve made the trumpet in the centre quite short as I didn’t want the bloom to flop forward. 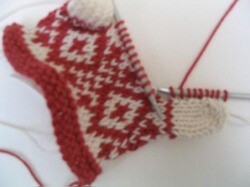 A couple of extra rows before and after the picot row will give you a longer trumpet. 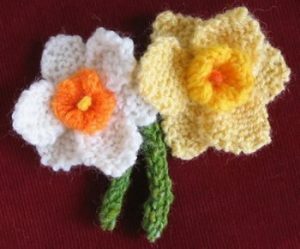 The daffodil together with a white narcissus with an orange centre (knitted same as above) make a pretty corsage. 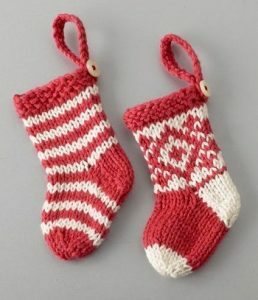 The stems are easily done with green yarn. Cast on 14 stitches. Work in stocking stitch for 2 rows and cast off. 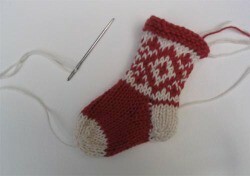 The stem will automatically curl showing the back of the stocking stitch. 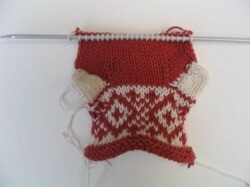 Use this as the right side and stitch together the two long edges to form a stem. To make a very simple knitted egg cosy use 3.25 mm needles. Cast on 32 stitches. Work 4 rows in garter stitch and 15 rows in stocking stitch. Break yarn and thread stitches onto it. Draw up and secure. 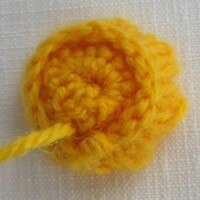 Stitch the two short edges together and you have a simple egg cosy. Turn inside out and tie up all ends securely and trim – no need to sew them in. Turn right side out.